Style master Porsche Design has just released a new range of glasses and sunglasses to coincide with Melbourne’s long awaited ‘coming of the sun’ for Spring 2012. With a full range of pure titanium frames, the main focus this year has been on Porsche Design’s return to its groundbreaking aviator sunglasses style … but with a twist. Is it a Porsche parked out front of Visual Q on Toorak Rd, or is it part of our new window display? Come to South Yarra and find out! Classics never go out of style, and this is definitely the case with Porsche’s signature 1978 model sunglasses. Encompassing thinner frames and minimal visual lines, the 2012 re-release adds a modern high-tech titanium touch to the original theme. Some models don’t even have visible rims – they’re stylishly hidden behind the lens. The new women’s range of sunglasses comes in a single piece shield style, following Porsche Design’s tradition of minimalist understated elegance. 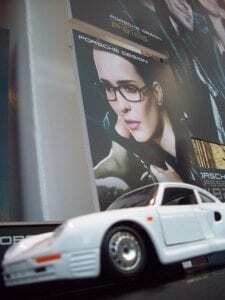 A view of part of our new Spring 2012 Porsche Design shopfront window display. Ever since the early days when Porsche first entered the sports car game, Porsche Design has always moved with the times. This is what has created its legendary reputation. Porsche is always evolving, and anyone who looks closely at these new sunglasses and designer glasses frames will easily see that these are the latest stage in a long-term process of evolving technology, style, and ‘cool’. The new Porsche Design glasses and sunglasses start at $499. Be part of the story. Call Visual Q Eyecare now, and we’ll organise a time to go through the entire new Porsche Design range together with you.